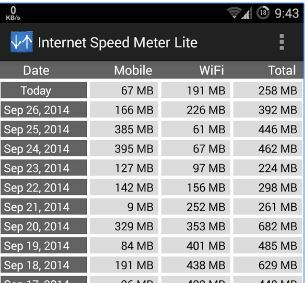 You may need to know the speed of internet connection in your device whether you are connected via data or via wireless and we will show you the program to know and control and Monitor your internet speed and the size of packets in your mobile. It shows you the amount of data roaming and speed when you connect to mobile data and wifi and also gives you the total. It also allows you to view the download speed in the top slot while you are using different applications or on the mobile desktop screen.